The San Antonio Spurs finally traded Kawhi Leonard after a year-long controversy and in the process obtained some solid players back to help them stay competitive and avoid a rebuilding process at least for now. The Spurs sent Leonard and long-time Spurs player Danny Green to the Toronto Raptors in exchange for DeMar DeRozan, Jakob Poeltl, and a future first-round pick. Along with adding Marco Belinelli from and forward Dante Cunningham through free agency and Lonnie Walker through the draft the Spurs look to have enough talent to make the playoffs for an NBA record 21st straight season. Dejounte Murray at point guard, DeRozan at shooting guard, Rudy Gay at small forward, LaMarcus Aldridge at power forward and Pau Gasol at center. DeRozan is expected to become a great player for the Spurs as he’ll give them another great scoring option next to Aldridge and both guys will get a ton of shooting opportunities. Patty Mills, Belinelli, Cunningham, Davis Bertans and Poeltl would come off the bench along with Manu Ginobili if, as expected, he decides to play one more season with the Spurs. DeRozan and Gay give San Antonio two great scoring options at the wing and Aldridge can score both from mid-range and inside the paint. The Spurs are quite deep and have enough talent to allow head coach Gregg Popovich to be crafty with his rotations. The starting lineup mentioned above gives the Spurs a nice combination of scoring and defense as Murray’s a lock at the guard position and Aldridge is a solid rim protector. Pau Gasol at center may help the team during the regular season, but he could struggle once in the playoffs as he’s a player already past his prime that’s lost a lot of speed. Depending on how he feels late in the season, Gasol would be better coming off the bench to contribute with ball movement on offense and do a bit of scoring and rebounding as well. If Poeltl impresses through the season and reaches the season fresher and healthy he could get the starting nod in the postseason. He’s a very mobile center that can finish at the rim, get rebounds and provide solid rim protection. Mills could sometimes crack the starting five as he can provide the Spurs backcourt with long-range scoring as he’s a capable three-point shooter. Gay has the talent to be the main scorer for the second unit, while Ginobili could then excel as their playmaker thanks to his driving ability to evade multiple defenders and pass it to the open shooters on the outside. Belinelli, who already won a title with the team in 2014, will provide the Spurs more shooting off the bench as he’s a solid catch-and-shoot player with huge talent from three-point range. 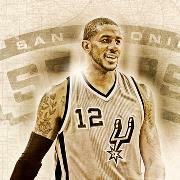 Although his shot selection is suspect at times he will help the Spurs spread the floor. Overall the Spurs should have another good season. Last year Aldridge carried this team without Kawhi Leonard and they still managed to win 47 games, so the additions of DeRozan and the rest of the new pieces should help them tie or, more likely, improve that record. Although it may take some time for these Spurs to click, once they do they will be very hard to beat. Look for the Spurs to reach the playoffs as they could win around 50 or more games this season, but don’t expect them to make the conference finals.